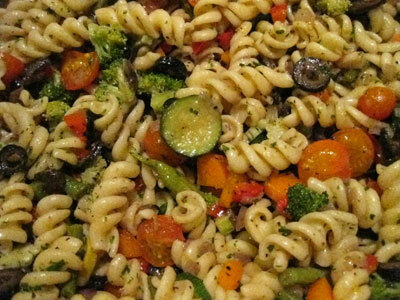 This summer pasta salad hits the spot on hot days, and you can mix-and-match whatever fresh veggies you have on hand. Boil pasta according to instructions on package. Drain and rinse in cool water and put in a large bowl. While pasta is cooking, chop the olives and tomatoes; set aside. Chop the mixed veggies/onion into bite-sized pieces; put in a pan with the olive oil to sauté until crisp-tender. Add veggies to pasta bowl along with the olives and tomatoes. Add the parsley, salt and pepper. Toss with enough salad dressing to coat all the pasta salad. Chill well and garnish with the grated cheese when served. YUM!